Spring is only a month away, and for those of us in the South that means it’s almost time to break out those Lilly Pulitzer dresses! 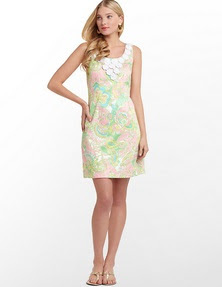 Every Southern girl knows that owning a Lilly dress is an essential part of her wardrobe. I have to admit, I have a section of my closet dedicated to Lilly Pulitzer dresses; what can I say…they are classic and never go out of style. A Lilly dress is an investment and something you can wear for years to come! In the South, they are acceptable to wear to almost any occasion: football games, parties, weddings, or just to wear for everyday life! Here are some of my favorite Lilly dresses from the 2013 spring collection!